Director Steven Knight's Redemption (Hummingbird in the UK) sees Jason Statham in the lead role of Joey Jones. Jones is a former Royal Marine commando who, on a tour in Afghanistan, took justice into his own hands after the ambush and killing of other personnel in his patrol. Court-martialled, he now finds himself avoiding detection from authorities, living rough on the streets of London, with very few friends. One such friend, though, is Isabel (Victoria Bewick), another down-and-out, and after a touch of trouble with a local street gang wherein the two become separated, Joey takes refuge in a rather plush apartment whose owner just happens to be away for a few months. The other friend Joey has is Christina (Agata Buzek), a nun who works the local soup kitchen for the homeless who herself has a chequered past, whom Joey uses for medication and information while Christina gets Joey sobered up. This is the first part of the film and to be honest it flows as well as it sounds; it gets to where it needs to be in a roundabout sort of way. The second part, seeing Joey Jones caught up in the underworld of London with vengeance on his mind, works a lot better. The second part of Redemption also has two or three different threads of storylines, which all again work well when looking at the bigger picture, though I personally feel they could have gone a little deeper. The cinematography in Redemption is right up there. Scenes shot in parts of London that do not appear on tourists' postcards do sometimes look a bit seedy; this does not. There are plenty of dark alleyways that show a darker, more natural side to London; by contrast, there is Damon's (Danny Webb) apartment where Joey finds refuge, just oozing designer ranges. Taking that on board, is this really a Statham movie? I believe so but there are two ways of looking at it; you'll be pleasantly surprised that the man has taken a role slightly different to ones you've always expected him to play, pushing the boat out a little more than he normally does, which he does well. This is the side of the coin I like. Or, perhaps, you'll be disappointed because, as his face adorns the poster on the wall, you'll be expecting him to be running amok around town breaking bad guys' bones all the time. You won't be satisfied in that respect, although what fight scenes there are in the film are choreographed quite well. 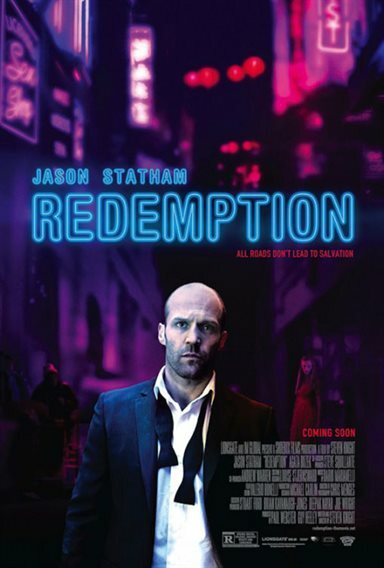 Redemption is a gritty thriller that's a bit ragged around the edges, and it has the added bonus of being the best Jason Statham movie to date. Download Redemption from the iTunes Store in Digial HD. For more information about Redemption visit the FlickDirect Movie Database.